Q1: Have structures equipped with Damptech rotational friction dampers experienced any real earthquakes? Q2: Is the behavior of Damptech’s Rotational Friction Dampers (RFD) dependent on the magnitude of the earthquake and loading velocity? Q3: Are the environmental conditions including temperature variation, corrosion, and time, influencing the operation of the rotational friction dampers? Q4: Does stress relaxation occur in the bolts of Damptech Rotational Friction Dampers (RFD)? Q5: Does the corrosion of the plates outside of the friction interfaces occur in Rotational Friction Dampers (RFD) over time? Q6: Is fire resistance required in such systems? What is the approach? Q7: Is it necessary to/ possible to re-center the structure equipped with Rotational Friction Dampers (RFD) back to its initial position following a strong earthquake? Q8: Does the spontaneous jerking motion in multiple-layered friction plates known as stick-slip friction occur is Damptech’s dampers? Q9: Does the corner pinching in the hysteretic loops affect the operation of the device? A1: Yes. In addition to the several tests conducted on these dampers in respected laboratories across the world and full-scale shaking table tests of frames with rotational friction dampers, a number of structures equipped with such dampers in Japan and Greece have experienced real earthquakes. The observed behaviour of the structures and the dampers was as highly reliable as predicted. In a very interesting case in Japan, a 12-storey residential building in Tokyo equipped with rotational friction dampers and health-monitoring systems was shaken by an earthquake in 2011, under which the registered records (response time histories) were highly consistent with those obtained from numerical modeling. Such an experience shows how predictable the behaviour of such dampers is. Furthermore, under several earthquakes in Greece, especially during the shaking measured 5.6 on the Richter magnitude scale in June 2008, a cement factory near the city of Patras equipped with rotational friction dampers was reported to have had a very exemplary behaviour. A2: No. Damptech’s dampers deliver a constant and stable friction at any size earthquake, regardless of velocity or frequency. Therefore, the behavior of Damptech’s RFD is independent on loading velocity. The patented design was first patented in 1999, continually improved, and most recently patented in 2014. One of the typical limitations of conventional friction dampers is the dependency of the friction coefficient on the velocity of sliding, which results in a variation in the force-displacement behavior of the damping system. What this means is that the damping will vary depending on the magnitude of the earthquake or vibration that the engineer is trying to control, and this makes the conventional friction damper behavior difficult to predict and therefore less reliable. Damptech rotational friction dampers have completely resolved this issue, by employing novel technologies in the design and fabrication of the frictional plates. The results of laboratory testing conducted on Damptechs’s rotational friction dampers illustrate that our dampers provide consistent constant friction over virtually unlimited cycles at all velocities and frequencies. A3: No. The results of the tests performed on Damptech rotational friction dampers with many cycles, equivalent to tens of continual earthquakes with no time lag in between, showed that such dampers are not affected by the variation in temperature. In addition, rotational friction dampers are highly resistant to sun light, aerosols, etc. The installation of such dampers in the structure of the cement factory near Patras, Greece, which operates in very corrosive and harsh conditions highlighted the surprising durability of such dampers to the environmental conditions. A4: No. One of the important points in the behaviour of Damptech friction dampers is their stability of characteristics over time. The clamping force required to maintain the slip capacity of any friction dampers is supplied by prestressed bolts. If any stress relaxation occurs in the bolts this directly results in loss of the damper slip capacity. In fact, one of the important advantages of the rotational friction dampers over other friction dampers lies in this point. All of the tests carried out several weeks after the fabrication of the dampers show that practically no particular short-term stress relaxation occurs in the bolts. In addition, the long-term relaxation of the bolts in rotational friction dampers is completely tackled through the use of disc springs. This component brings a great advantage over the other types of friction dampers. Another acute problem existing in old-generation friction dampers and addressed by rotational friction dampers is the stress drop in the bolts due to the erosion of the friction contact interfaces after several loading cycles. This issue is also overcome in rotational friction dampers by the above-mentioned disc springs. Q5: Does the corrosion of the plates outside of the friction interfaces occur in rotational Rotational Friction Dampers (RFD) over time? A5: No. In linear (unidirectional) friction dampers, the area outside of the part limited by friction plates replaces the area limited by the friction plate and the steel plate during the earthquake. With time, after decades from the installation of the dampers, the corrosion in the area outside of the friction plates of these linear friction dampers results in a rusty surface that would be in contact with the friction plates during an earthquake. Such a variation in the frictional properties of the steel plates increases the force resisted by the damper, producing unpredictable response of the damper and overstressing the bracing and their connections. In the rotational friction dampers this problem was handled by the adoption of the rotational friction instead of linear friction, such that the area of the steel plates outside the friction plates does participate in energy dissipation. A6: It is not typically required. If the client imposes such a requirement, it can be fulfilled simply by expansive protective paints or fire resistant fibers, which have no effect on the operation of the dampers. In addition, fire resistant gypsum board panels or a fire blanket can be also used for the purpose. It should be noted here that the codes do not specify any requirements for fire protection of lateral-load-resisting systems because they do not participate in gravity load bearing. A7: Following a small or medium earthquake, the elastic restoring forces of the structure would be enough to bring the dampers back to their initial configuration. No re-centering is needed. If a major earthquake strikes and the dampers come to rest longer or shorter than the original length, loosening a limited number of the prestressed bolts following the quake will temporarily reduce the slip capacity of the dampers, allowing the structure to return to its initial position with the help of its accumulated elastic strain energy. Afterwards the damper bolts can be re tightened to the design force level thus making the damping system ready again for future earthquakes. This is another advantage of the rotational friction dampers over the linear friction devices in which a large number of bolts are supposed to be loosened and tightened, a process which is tiresome and lengthy and may cause damage or buckling to the damper plates. A8: No. One of the important points in the behaviour of friction dampers, in which sliding occurs in multiple sliding surfaces, is the issue of simultaneous slipping at several interfaces. 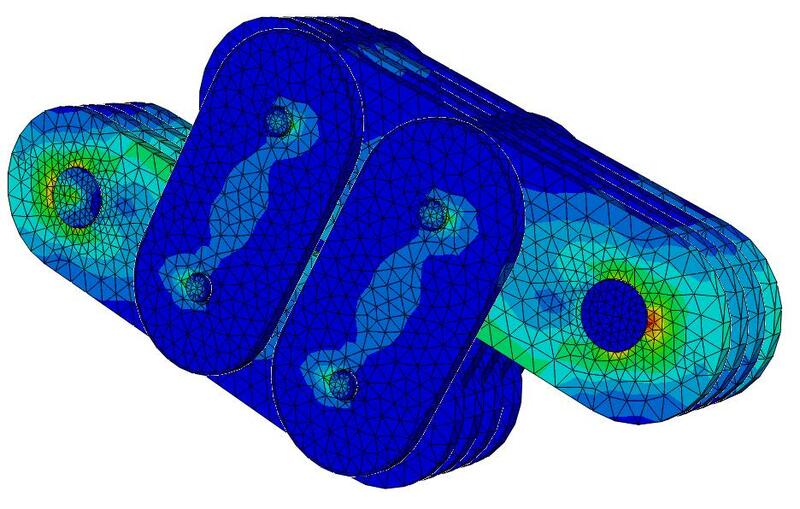 According to years of test results, such a problem has not been observed in Damptech’s rotational friction dampers in contrast to other types of friction dampers. Damptech has developed its high tech friction material over 15 years of testing and development. Moreover, linear friction devices are more susceptible to sticking than rotational friction, because rotation friction has the advantage of variable angular displacement and velocity. A9: Not actually. For some types of rotational friction dampers a little pinching is observed at the two opposite corners of the force-displacement relationships. In this regard, it should be noted that this phenomenon is observed in the behaviour of most of the friction dampers throughout the world and its effect is minor. Such a small pinching (shown in figure below), which reduces by 1% to 2% the area of the hysteresis loops, has no significant influence on the energy dissipation capacity.